First responders at the seen of a shooting at Tree of Life Synagogue in Squirrel Hill on Saturday, Oct. 27, 2018. First responders surround the Tree of Life Synagogue in Squirrel Hill, where a shooter opened fire on Saturday, Oct. 27, 2018. Emergency responders at the scene of an active shooting in Squirrel Hill. The exterior of the Tree of Life Synagogue in Squirrel Hill where police are responding to an active shooter. Officials say 11 people were killed when a shooter opened fire during a baby naming ceremony at a Pittsburgh synagogue on Saturday. *This post was updated at 4:50 p.m.
At least six other people were wounded, including four police officers who dashed to the scene, authorities said. That number did not include the suspect. Police said a suspect was in custody after the attack at the Tree of Life Congregation in Pittsburgh's Squirrel Hill neighborhood. Law enforcement officials identified the suspect as Robert Bowers and said he is in his 40s. At an earlier briefing, Pittsburgh Public Safety Director Wendell Hissrich said that the shooting was being investigated as a hate crime, falling under the jurisdiction of the FBI. "It is a very horrific crime scene. It's one of the worst that I've seen and I've been on some plane crashes," said a visibly moved Hissrich. Scott Brady, the U.S. Attorney for the Western District of Pennsylvania, said that criminal charges would be filed against Bowers shortly -- possibly the same day. Officials said Bowers is a Pittsburgh resident and had at least three handguns and an assault rifle on him during the shooting. At least four people were being treated at UPMC hospitals, three of whom were in surgery Saturday afternoon, the hospital tweeted. Another patient was treated and released. None of the victims of the shooting were children, officials said. The tree-lined residential neighborhood of Squirrel Hill, about 10 minutes from downtown Pittsburgh, has a heavily Jewish population. In 2010, Tree of Life Congregation — founded more than 150 years ago — merged with Or L'Simcha to form Tree of Life* Or L'Simcha. 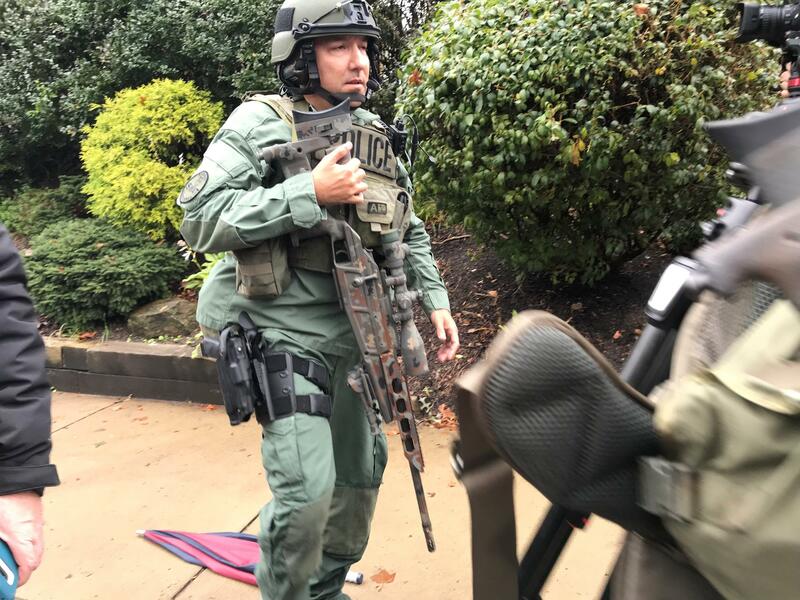 A SWAT officer responds to Tree of Life Synagogue in Squirrel Hill. Rabbi Chuck Diamond, who was with the Tree of Life Synagogue until a year-and-a-half ago, said he feels for the congregation and has been getting messages from people saying Saturday’s shooting is an act of hate. "There's a lot of anti-Semitism out there, and a lot of hate every day. It's sobering that it's touched our community," he said. Diamond said Shabbat service on Saturday starts at 9:45 a.m., which is a "low traffic time," but the building's doors usually are open and unlocked during this time. He says he's concerned about the people who would have shown up early for the service. Despite calls from public safety officials to stay indoors, some people showed up at the scene outside of the synagogue along Murray Avenue or went about their daily activities. Diamond said he's been telling people to, "have faith, hang in there and be a comfort to others." The Red Cross is providing mental health services at the Jewish Community Center on Forbes Avenue to those impacted by Saturday’s shooting. And an interfaith vigil at Sixth Presbyterian Church in Squirrel Hill is also planned for 6 p.m. Saturday. Victim assistance line for those in need: 412-432-4400. Democratic State Sen. Jay Costa, who represents Squirrel Hill, condemned Saturday's shooting and offered condolences to those affected. "Gun violence anywhere is devastating, but to attack people in their place of worship is deeply horrific," he said in a statement. " ... [we] know that our Jewish friends and neighbors, and all of Pittsburgh, is in pain today." Israeli Prime Minister Benjamin Netanyahu also condemned the attack on Pittsburgh's Tree of Life synagogue. "I was heartbroken and appalled by the murderous attack on a Pittsburgh synagogue today," Netanyahu said in a video message posted on Twitter shortly after the attack. He added, "We stand together with the Jewish community of Pittsburgh. We stand together with the American people in the face of this horrendous anti-Semitic brutality. And we all pray for the speedy recovery of the wounded." 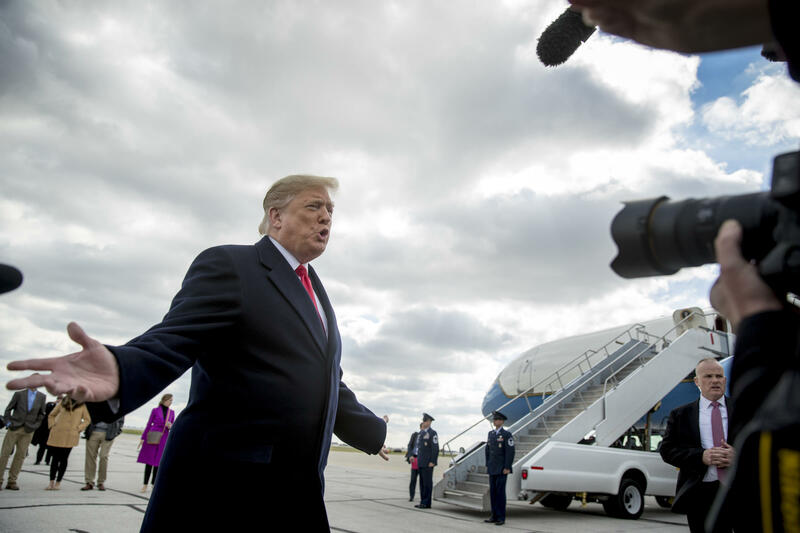 President Donald Trump speaking with reporters following the shooting at Tree of Life Synagogue in Squirrel Hill, which left 11 people dead. President Donald Trump called Saturday's shooting "devastating," saying: "It's a terrible thing what's going on with hate in our country." 90.5 WESA is working to learn more and will update this story as more information becomes available. Reporters Lucy Perkins, Sarah Schneider, Megan Harris, Liz Reid, Kathleen J. Davis, Amy Sisk and Sarah Kovash, as well as the Associated Press, contributed to this story. Voters in Pennsylvania have until Tuesday to apply for absentee ballots for the November 6th midterm election--and until Friday to send them in to their county elections board.